Maine offers romance by land and by sea. Historic inns and quaint bed-and-breakfast lodgings dot the landscape from the coastline to the mountains, and four seasons of activities make Maine a year-round destination. As you sample the classic New England cuisine, immerse yourself in the state’s nautical history or sail off into the sunset; love will surely be in the air. 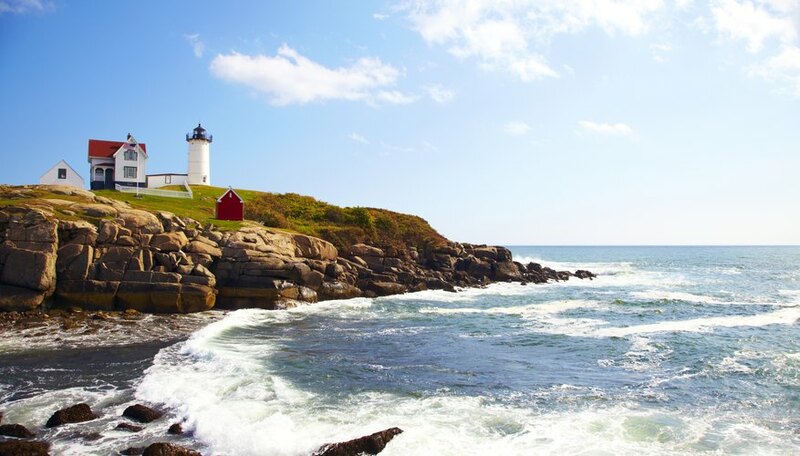 Maine's coastline offers plenty of opportunity for romance. The Sagadahoc Bridge from Bath leads visitors over the Kennebec River to the islands of Arrowsic and Georgetown. With a rich history going back to the 10th century Vikings, the islands have retained a sense of their seagoing heritage, and are a favorite destination of those favoring off-the-beaten-path destinations. Couples looking for romance may choose to stay at one of the area’s many historic inns or bed-and-breakfast accommodations, or rent an intimate seaside cottage for two. The islands offer many hiking trails, unspoiled beaches and historic monuments to tour during the day, as well as several lighthouses offering sweeping views of the water. A sunset sail offers a romantic prelude to an upscale dinner at one of the area’s best restaurants, such as The Osprey or Robinhood Meetinghouse. The central area of the state is home to Maine’s Highlands region, also known as the Moosehead region. Although the Highlands offers four seasons of activities, the region comes alive in the winter. The region offers more than 1,000 miles of snowmobiling trails and plenty of opportunities for ice fishing, downhill skiing and dog sledding. Romantic couples might enjoy getting away from the crowds and exploring the area while cross-country skiing, snowshoeing or via horse-drawn sleigh. The accommodations in the Katahdin, Lincoln Lakes, Moosehead Lake and Sebasticook Valley regions of the Highlands lean towards the rustic, offering a choice of campgrounds, rustic inns and cozy cottages. Those looking for a more upscale stay might choose a hotel in the greater Bangor region, like the Black Bear Inn or Atlantic Oceanside Hotel. Maine’s largest city, Portland, served as the state’s capital until it relinquished the title to Augusta in 1832. The area offers visitors an eclectic mixture of classic New England life and rich seagoing history alongside upscale dining, boutique shopping and a vibrant nightlife. Many romantic weekends start at The Inn on Peaks Island. Available only by boat, the inn’s six cottage-style rooms include whirlpool tubs and private decks offering a view of Portland’s skyline and the Casco Bay. Maine offers the chance for romance on the open ocean. Most of the coastline cities are home to companies that offer both private and group charters on everything from small sailboats to larger yachts. The Goddess of the Sea Cruises out of Boothbay Harbor offers one- and two-day sailing experiences designed for couples in love. Spend the day spotting whales, seals and dolphins before anchoring for an intimate lobster dinner. Snuggle up below the stars and let the waves rock you to sleep at night, or get up early to watch the sun rise over the water. Wickford, Hannah. "Romantic Vacations in Maine." Dating Tips - Match.com, https://datingtips.match.com/romantic-vacations-maine-7957335.html. Accessed 19 April 2019.